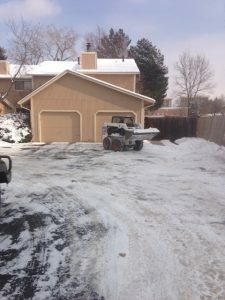 Snow Removal - Fort Collins Snow Clearing | Advanced Landscaping & Sprinklers, Inc. If there’s one thing those of us living in Colorado know about, it’s snow. During winter, and frequently in autumn and spring, we’ll get hit with blizzards, ice storms, flurries, and good old fashioned snow showers. While that snow can create some gorgeous vistas, it becomes a lot less beautiful when we have to walk through it, drive on it, or shovel it. At Advanced Landscaping & Sprinkler, we don’t just handle your irrigation systems and keep your greenery beautiful. We’re also equipped to handle snow removal, and we know rapid removal is the key. While getting rid of the snow is important, the ice that builds up under it is the truly dangerous part. Our teams will work to keep in from attaching to the pavement in the first place. By using de-icing agents, we can coat surfaces in order to keep pedestrians and wheels from slipping. When an exceptionally fast moving and heavy storm hits, sometimes accumulation is so fast and heavy that shoveling out on your own isn’t realistic. No problem, since we’ve got the equipment and experience to handle the worst that Mother Nature can throw at us. Whatever you need cleared, whether it’s walkways, driveways, sidewalks, or all of the above, we’ll make sure it’s done thoroughly and professionally. In Colorado, winter can be tough, but it doesn’t have to be tough on you. Contact us today for a free estimate!